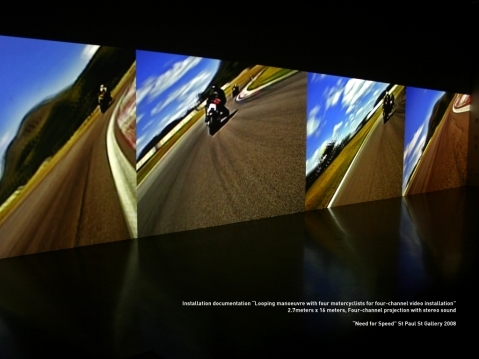 Looping maneouvre with four motorcycles for four-channel video installation, Alex Monteith, 2008 from Alex Monteith on Vimeo. A choreographed action in which four riders participating in the fast-speed group riding sessions at MotoTT Taupo motorsport-park ride sequentially (locked in a line 1,2,3 & 4). The riders followed eachother in sequence nose-to-tail for the duration of the session. The 30 other riders partcipating in the fast-group session move between the four riders (or are organically overtaken by their formation of four) whilst the group maintains its order. Each rider has a forward mounted on-board bullet camera used to record the ride for re-installation in a gallery context. Need for Speed, solo show, gallery no2, St Paul St Gallery, Auckland, Aotearoa / New Zealand, July 2008. This event was a collaboration between Alex Monteith, the four riders above and MotoTT track-days who supported and regulated the safety of the performance.